Happy hour. It feels good just to say the words. Happy hour means “I get to cut loose from the troubles, unhappiness, and mundanity of my day (assignments, meetings, plastic containers of baby carrots and hummus) to go have fun and be irresponsible (cocktails, fun food, friends, alluring strangers)." Happy hour, or cocktail hour as I prefer to call it, has gone through many iterations: the Prohibition speakeasy where you gathered for your fix before heading out to the dry restaurant; the postwar home cocktail hour as a show of domestic abundance with matching shakers and glassware; Fridays at Chili’s with the girls from the accounting department; pregaming at your friend’s apartment with a bottle of cheap wine while you change outfits 14 times before hitting the club. The desire to relax with people you like while having an alcoholic beverage at the end of a tough day is universal. It signals the transition from day to night. It lets you know that the fun begins now. Happy hour transcends borders. In France they call it l’apéritif — same experience, different word. In Italy they call it happy hour — same word, different experience. There, the food is a major focus. Drinks are more expensive, not less, but accompanied by outrageous spreads of gorgeous meats and pastas. Or so says Jason Wilson in his evocative Imbibe magazine story on happy hour in Milan from a few years back. One of these days I’m going to have to go check it out for myself. Here in the U.S., when it comes to snacks, both out at bars and in the home, happy hour exists in a kind of limbo where there are no rules. You’re not obligated to serve a full meal, but it’s dinnertime and people are hungry. People are also tired and sick of being good. We want treats. Happy hour is an excuse to eat everything we love but won’t allow ourselves during more practical hours. In Portland, where I live, the nicer restaurants and bars step up their happy hour from nachos and buffalo wings to sweet potato and truffle fries, sliders with foie, mussels steamed in broth. Decadent and delicious stuff, but who wants to cook like that when you’re having people over at home? When I host cocktail hour, as a general rule I don’t cook at all. It’s enough work making sure there’s enough ice and toilet paper. Instead I usually rely on bread, cheese, and olives, and I don’t serve drinks that require shaking. Keeping it happy means keeping it as stress-free as possible. But if I did cook for my guests, I would make truffle fries. Truffle fries are the ultimate upscale happy-hour food. They elevate a well-loved snack enough to not make the place look bad, while still representing all the things drunk people love: salt, starch, grease, and savoriness. The first time I saw truffle fries in a restaurant I thought it was the most decadent, fancy thing in the world. In the last few years, they have been popping up at more and more spots, including places I wouldn’t expect to see truffles on the menu. As it happens, truffle fries are not really made with truffles, the way that Kraft Singles are not really cheese. They are made with truffle-flavored oil, which gives a crude approximation of truffles’ ultra-umami flavor while remaining affordable. True foodies will turn up their noses at truffle oil. I still think it is absolutely worth dousing stuff in. The best truffle fries, like all French fries, are deep-fried twice. In the sheepish way that many meat eaters are squeamish about killing animals but OK about eating a steak in a restaurant, I will never deep-fry anything at home because I find it abhorrent and shocking to cook with that much oil, but I will happily devour truffle fries, fritto misto, tempura, hot wings, or jalapeño poppers in a bar by the plastic basketful. 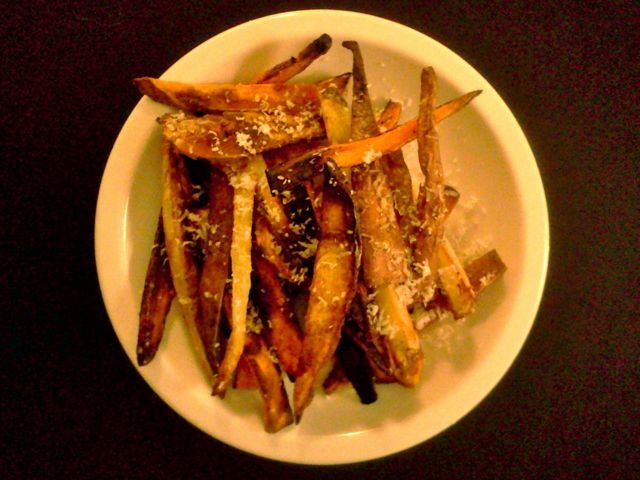 The closest I can bring myself to making bar-style truffle fries at home is oven fries. While not as decadently crispy and fatty as the real deal, they still satisfy the salty-starchy craving, and aren’t as scary. It also seems like when you have bigger potato chunks and less fat, you taste the potatoes better, whereas sometimes in a bar all you taste is the combination of all the appetizers that have passed through the deep fryer that night. These oven-crisped truffle “fries,” adapted from the excellent cooking blog How Sweet Eats, are actually a pretty close approximation of the eye-rolling deliciousness you get with the real deal. Jessica’s recipe uses both regular and sweet potatoes — trend on trend, yes, but tasty, and arguably healthier than just russets, although nobody really cares about that at happy hour. They’re easy enough to whip up stresslessly when you’re having guests over for cocktail hour. Keep some extra cut-up potatoes in water in the fridge in case you need to make another batch. I simplified the recipe to make them easier to throw together when you’re a couple of martinis deep and people are getting antsy. Your friends don’t need to know that these are made with truffle-flavored oil — and really, at the point when they are snacking on homemade treats and drinking your beer, who is anyone to argue? In fact, now that I know it’s this easy to make badass truffle fries at home, I might start forgoing the bar for cocktail hour at my place. No marked-up beer, drunk guys on the prowl, or snooty waitstaff. Instead, only the truly happy things about that special time of day: good friends, stiff drinks, and devilish delicacies. Cheers! Soak potato pieces in water to remove starch for 30 to 60 minutes. Preheat oven to 425 degrees. Pat potatoes dry with a towel, then transfer them to a jelly-roll pan. Toss with olive oil, salt, and garlic powder. Bake for 25 minutes, then flip them around and bake for another 25 minutes. Remove from oven, sprinkle with Parmesan cheese, and drizzle with the truffle oil. Toss to coat. Taste and add more salt and truffle oil as needed and re-toss. Serve topped with more Parmesan.